Description: Southbound intermodal crosses over itself on Tehachapi Loop. Description: This BNSF Dash 9 led stack train didn't let up at all coming through the yard. A Heritage I helper follows. Description: As evening comes upon us, another westbound leaves the yard in Wellington toward Amarillo! 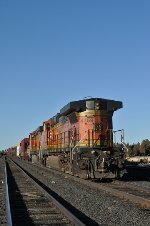 Description: BNSF 4682 leads this loaded grain train through Kelso, WA.